Sorry Dream balls/ tickets can't be added to existing accounts. No Yellow/Red card, No Third party cheap Dream balls. 550-650 Dream balls. All story/raid dream balls available for farming. For Global Server only. 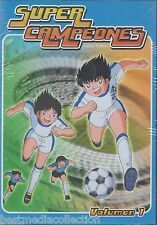 (Captain Tsubasa Dream Team Global Starter. Rank 1 Fresh condition. 300-400 Dream balls. All story/raid dream balls available for farming. You will receive account with d) After receiving my confirmation, you may login from your device. Title: Super Campeones. Number Of Discs: 6. Format : DVD, Color. Region: 1 & 4. Release Year: 2014. (Brain or Tsubasa Starter account not both. No Yellow/Red card, No Third party cheap Dream balls. For Global Server only. All story/raid dream balls available for farming. d) After receiving my confirmation, you may login from your device. DF Players In Account. DF Napoleon. DF Schneider. DF Matsuyama. After receiving the confirmation, you may login from your device. Story mode and Raids almost untouched! (May take a couple hours!). Captain Tsubasa & Coco Ichibanya Campain. Tsubasa Oozora --- Spoon Rest. "Coco Ichibanya" = famous Curry restaurant in Japan. Robert Hongo --- Spoon Rest. Ryo Ishizaki --- Phone Stand. Kojiro Hyuga --- Pen Stand. Yujin 2002. ultimate goal". preowned, in MINT condition. Color may have a deviation ,Due to reasons such as light, display. If there is the box in the photo, the box is attached. Size: approx. 120 x 120cm (47.2" x 47.2"). Adidas Ã— Japan National Team Ã— Captain Tsubasa. Special Triple collaboration T-shirt not for sale. It is a rare thing which can not be obtained easily now, and the state is also good. Size: L (Length 65 cm, Width 52 cm). Size : Pen holder -- Approx. 8 cm (3.14") in height, weight 15g. Manufacturer : GEORGIA. From the "Holly & Benji Exclusive Collection" series issued in Italy. Plastic statue is approx. #G10:Anniversary Roberto WC 2017 Ken DF Kaltz SOLD. No Yellow/Red card, No Third party cheap Dream balls. For Global Server only. All story/raid dream balls available for farming. Rank 1 clean account. Dream Fest: Brain Napoleon Levin Rivaul Misugi Pierre. Rank 1 clean account. No Yellow/Red card, No Third party cheap Dream balls. For Global Server only. All story/raid dream balls available for farming.